It's now become part of our travelling calendar - we go on a city break for Jayne’s birthday in January - no presents for birthday's and Christmas, we travel instead. This year it was Seville. We had to drive 180 miles south to Stansted to fly there though, Friday afternoon on the A1, such fun... It was a really good drive down in actual fact, the best day for months, glorious blue sky and a fantastic sunset- and I was in a car. We got stung for tea and drinks in the Radison Blu but we were overnighting and leaving the car so we didn't have much choice. Ryanair aagh! Again no choice. To be fair to the abrasive Irish man O Leary things are better than they used to be and it was an acceptable flight. We were hoping for better weather than we got- don't you always? It was. cold, windy and after some initial beautiful sun on our first afternoon, it was mostly grey. The wind died but so did the sun. The other little problem was that it was my turn for the awful cold that Jayne had been trying to get over. I was under the weather in more ways than one all week, it was only a cold but it was the worst I've had for ages and it didn't help my mood, particularly when the sun was absent. We had a few hours of really nice light here and there and I made the most of it - I think! Seville has miles and miles of narrow cobbled streets, they seem to go on for ever. They are almost random in layout and it is extremely difficult to find your way around, it's easier to just keep walking and see what you find. So we did! The architecture is stunning and the history is fascinating. Aside from the ancient history the two events that seem to have had a massive recent influence are the Expo's of 1929 and 1992. The incredible buildings or 'Pavilions' that were built for a one off event are now part of the reason that people visit the city. The 1929 pavilions are fantastic, each one is a story in itself and a destination in its own right but there are a lot of them in Parque Maria Luisa. Plaza Espana, built by the hosts of course, is the biggest and I would imagine that you could make a project out of photographing the individual ceramic tile displays around it on their own. These incredible buildings really need the light to be right to get images that people want to see, flat bright light from bright grey skies is good for certain things but dramatic architecture deserves better - or maybe I'm looking for the easy way option. The other discovery that we made, we found just down the road from the hotel, about an hour into the trip – The Metropol Parasol. A giant lattice work parasol, apparently called ‘The Mushrooms’ locally and apparently the world’s largest wooden structure. You have to look twice, having discovered that it is wood. Only later did we discover that we could get to the top and there is an extensive walkway around the top of it. It is built on top of ancient ruins, ( still intact and viewable) a food market and bars etc. and has a plaza around it and on it, that is buzzing on weekend evenings. Walking around the top, the first people up it one day and being back to watch the sunset later was one of the highlights of the trip for me. The 1992 Expo also covered a massive area but left behind lots of modern - and some very strange - buildings and arenas. Some are of a temporary nature and get dismantled others find a new use. The land used was on an island between two branches of the River Guadalquivir – Isla de la Cartuja. The branch that goes through the city is now a canal, blocked at its northern end by a barrier with a motorway on it, and is used extensively for water sports, mainly rowing. Many of the buildings are now used by private companies as headquarters , others have a very derelict look. The whole area- even though it is home to the theme park- which was shut for the winter, has a neglected air about it. There are weeds growing everywhere but fountains are switched on, which seemed odd. Unlike the city a short distance away, there are no cafes or bars or other people around for that matter, just us meandering through. The car park that was created for the event is massive, it stretches for miles, and I really mean miles. Totally derelict, just the odd person or dog walker around. There is even a railway line terminating here, in the middle of nowhere a modern and apparently unmanned station, like a ghost station. At this point, across the river proper is open countryside, much flatter than I expected and very easy for local walkers and cyclists to get to - also very calm and quiet, a place to linger and enjoy the peace. As usual I researched and discovered as we walked, we averaged around 13 miles a day and tried to get off the beaten track. We were out around 8.15, before sunrise, and had orange juice, coffee and Tostada with the locals for breakfast. The trouble is that there are many miles of walking in a relatively small area, some streets are only a few feet wide so there are a lot of them to explore. 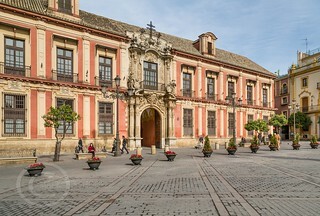 Incredible ancient churches and squares are around every corner- it's a very religious place - Catholicism rules in Spain. Unfortunately many are only a few feet away from the building next to it and it is difficult to get a decent shot of them. 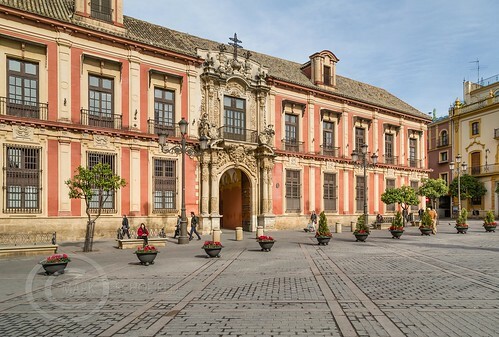 Seville is also famous, historically, as a producer of ceramic tiles. A building isn’t complete without a tile display of some sort and it would be very easy to make a project out of tiles alone. It may be a little boring for any companions though! We walked the length of the embankment a couple of times, it has graffiti from end to end, several miles of massive concrete walls covered in everything imaginable, from marker pen scribbling to works of art. It was suggested to me that allowing people to paint here might prevent them from daubing property and monuments in the city- it hasn't! Most alleyways and shutters have been attacked to a greater or lesser degree. Spain has very high youth unemployment and maybe this plays a role. To be truthful though we haven't seen a city that's free of graffiti. The other problem is dogs- or what they produce, it's everywhere, absolutely everywhere, in a week we saw only one person remove his dogs mess. Fortunately the city streets are cleaned exceptionally well, some of the cleanest we have come across, men (and a lot of women) and machines are washing and sweeping endlessly. Having had the wettest winter on record at home - almost three months of rain - we didn't want more rain but we got it. The upside was the water and the reflections that it created made photography on the cobbled streets more interesting, particularly at night. I usually find that it takes me a while to get into the groove on a trip and this one was no different, I didn't start shooting with total disregard - street shots- for a couple of days. Whilst the locals wore quilted jackets and scarves we got down to tee shirts at times, the warmer afternoons would be welcome in summer, never mind January, in Huddersfield. I envied the cyclists, being able to train in temperatures like this in winter - I wish! You need a lot less willpower to get out there and train hard in pleasant weather. From a photography point of view I had a frustrating time, I never felt to get to grips with the place- other than on the streets at night. Writing this on my phone on the flight home, I haven't a clue what I've got to work with when I get back. I usually edit first and write later. Generally I have a first look, I'm disillusioned, I then revisit and see things differently- thankfully! Architectural shots with a grey sky could be destined for the monochrome treatment, we'll soon see. I'm still editing stuff from our London trip before Christmas, it's getting decent views in black and white and I quite enjoy looking at them myself. We visited most of the notable tourist destinations, and went up anything that we could. Seville doesn't have a high point-it's flat! Nothing really stands head and shoulders above the city. The Cathedral tower is over 300 feet but the Cathedral itself fills a lot of the view on some aspects. Being square and having to look through bars in recesses you don't really get a completely open aspect. A new 600 foot tower is close to being finished, it's an office block and I couldn't find any mention of it being a viewing point in the future. Oranges were the last thing on my mind when I suggested going to Seville. There are 25000 orange trees in Seville and now is the time that they are laden with big-and sour- Seville oranges, they are everywhere, apparently they are the property of the city authorities and will be harvested and sent to the UK to be made in to marmalade at some point in the near future. These trees will soon be covered in fragrant blossom, the city will smell beautiful for a couple of months. Studying the surrounding area it would be good to tour in March or April I would think, the scents, longer days and better weather would make for a fantastic trip. One for the future. The sunrise on our final morning was the best of the week, this was what we had looked forward to, we had to leave for the airport at 9.00...... Needless to say it was raining hard as we drove the last twenty miles home. Nothing new there then. As usual I have aimed to present a pretty extensive collection of photographs of our chosen destination, some, at first glance will be pretty mundane shots of everyday life on the streets, often though, close inspection will reveal something humorous, something that needs a bit of thought. Others are definitely just people going about their holiday or work. Travelling with someone else it wouldn’t be fair to spend an inordinate amount of time trying to nail the perfect long exposure or HDR image of a cathedral or similar in perfect light – the one stunning shot to add to the portfolio- it’s not really my thing, I go for an overview of the place in the time available. Looking at the postcards locally it becomes obvious that stunning shots of some of these buildings are hard to come by. Heavily corrected converging verticals were quite obvious – and most likely will be in my own shots. As the owner of tilt and shift lenses I never travel with one – ever! My knees are already creaking from the weight of the bag.